Since 2010, Westminster Christian School has made a considerable investment in facilities and curriculum to support the school's focus and the students' interest in science, technology, art, and engineering. In 2012, WCS opened a new state-of-the-art science facility for middle and high school students to support the research taking place and curriculum being taught in the classroom. In 2017, the TIDE Center was built to provide classroom space for courses specifically focused on technology, innovation, design, and engineering. As a school that educates from preschool through 12th grade, WCS is uniquely positioned to respond to the academic needs of students as they grow and interact with our curriculum. 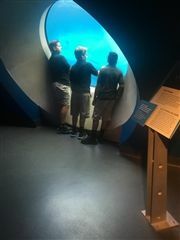 The Middle School engineering students took a field trip to the Phillip and Patricia Frost Museum of Science in downtown Miami on Fri., Oct. 19. Students from Mr. Gambrell’s, Mrs. DeWitt’s, and Mrs. Gordon’s engineering classes visited the Planetarium, attractions and the special exhibits showcasing early engineering inventions by Leonardo DaVinci.